Fr. Paul J. Campbell, St. Christopher, Chester, Maryland Pastor, has died. Maryland passed away on the evening of February 3, 2019 after a brief illness. He was 66 years old. “I am saddened to have to inform you that our brother priest, your pastor, Father Paul Campbell, passed away this evening at 5:44 p.m. as a result of the stroke that he suffered Friday evening,” The Most Reverend W. Francis Malooly, Bishop of the Diocese of Wilmington, said in a February 3, 2019 message to the parishioners of St. Christopher. “I ask that you please keep Father Paul and his family in your prayers as well as your fellow parishioners at St. Christopher’s. Please know of my prayers and that of our entire diocese which are afforded you at this time,” the Bishop added. Father Campbell was born in Wilmington, Delaware on October 23, 1952. He attended Christ Our King Elementary School, Salesianum School, De Sales University, and De Sales Theological College in Washington, D.C. He was ordained a priest for the Oblates of Saint Francis de Sales on June 12, 1982. As an Oblate, Father Campbell taught at Bishop Verot High School in Fort Myers, Florida, Father Judge High School in Philadelphia, and Salesianum School in Wilmington. He served as Associate Pastor of Saint Anthony of Padua Church in Wilmington, Delaware. 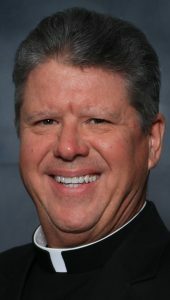 In 1996, he was received into the Diocese of Wilmington where he served as Associate Pastor of Saints Peter and Paul Church in Easton, Maryland; Saint Francis de Sales Church in Salisbury, Maryland; and Saint Joseph Church in Middletown, Delaware. He served as Pastor at Sacred Heart Church in Chestertown, Maryland. In 2015, Father Campbell was installed as Pastor at St. Christopher Church in Chester, Maryland; a position he held at the time of his death. The Catholic Diocese of Wilmington was established in 1868 and comprises 56 parishes, 18 missions and 36 schools serving the State of Delaware and the nine counties of Maryland’s Eastern Shore. The diocese is in the midst of its year-long 150th anniversary celebration that will conclude on March 3, 2019. More information is available at www.cdow.org.